With the onset of the heating season, many pull out cabinets or buy in the store humidifier air. In heated buildings is usually very dry air, which adversely affects the condition. However, the majority forgets that this device requires careful maintenance. It needs to be cleaned every week. - a solution of chlorine. How to clean a humidifier air? Many do not know, but the answer is simple, as all ingenious. During the period of active use, clean the device at least once a week and remove the lime deposits that continuously accumulate on the aggregates. For cleaning of the humidifier air is better not to use a variety of detergents, they can negatively affect its work and, in addition, in the process of operation of the humidifier means the particles will be distributed throughout the room. If you use detergent, you and your family can appear headaches. 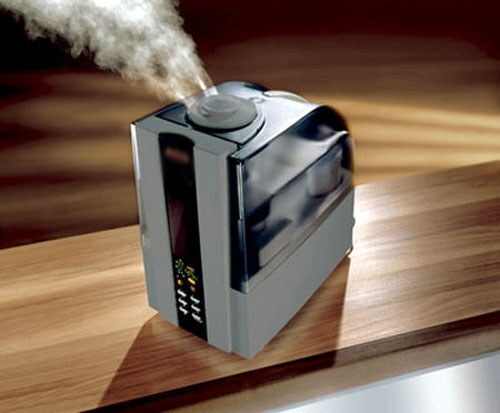 Before you clean humidifier, drain off all the liquid from the tank and thoroughly rinse it under running water. Now it is necessary to completely dry the container, however, in no case do not do it in direct sunlight. The nozzle of the humidifier needs special cleaning. You need to completely remove all the scum that accumulated on it. To do this, you cannot use abrasive products. The latter can damage the nozzle and cause damage to the humidifier. For descaling use protivopostavit solution or a weak solution of vinegar. Use a soft cloth which will not damage the parts of the humidifier. After that, the water tank you can pour a new batch and start the operation of the device. Very often in moisturizers appear undesirable microorganisms. To avoid this, it needs to be regularly disinfected. Do this by using a water and chlorine solution. Chlorine is found in most bleaches, so you can safely use your tool for whitening. After disinfection thoroughly rinse several times until the device until the chlorine odor is gone. Humidifier air require regular cleaning. The frequency of this procedure depends on how hard the water you use with it. If you regularly and thoroughly clean your humidifier 's air, it will serve you faithfully for many years.